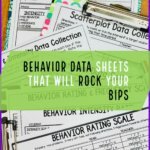 Taking a brief break from IEP goals (my brain couldn’t handle it tonight), I thought I would write about something that came up for a great kiddo I was working with the other day. He is great with identifying amounts of money and identifying the right amount of money when asked, but he doesn’t really understand what money means. He doesn’t understand the need to earn it and exchange to buy things. So I thought I would share some of the ideas I’ve used over the years to teach this skill. The picture to in the title is from my latest set of money task cards. Each set of task cards has cards with items with prices. They have different themes like the beach shop, grocery store and restaurants. 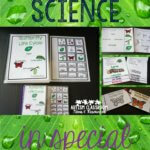 These cards are designed to be used so that the students can match the cards that have the money combinations on them with them. 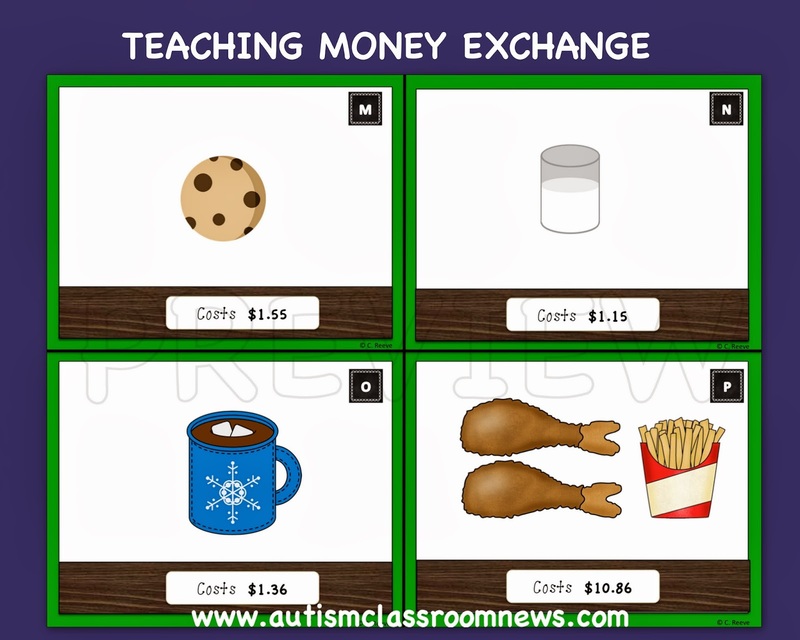 But they can also be used in individual or small group instruction to have the student purchase the cards by giving real or pretend money to help them understand the beginning of the exchange. 2. 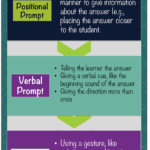 Have the student purchase reinforcers. This can be done in a few ways. I would start by giving the student a set of money and making a price list (for activities) or price tags (for items) of how much money is needed to purchase the reinforcer. For instance give him 5 $1 bills and have the prices be $2 or $3 (or $1 per minute for computer time or other activities). Then have him give you the money and he gets the reinforcer. Practice this with different amounts of money to get him used to it. This builds a reinforcer into it naturally. If he gives you the right amount of money he gets the thing he wants. As he gets good at this skill, you could start having him earn money from school jobs or as part of a token economy and then use that money to purchase desired activities. Lots of classrooms use a school store in this way as part of their token economy behavioral system. 3. Set up a grocery store in your classroom. Bring in empty containers and put prices on them. Then have students buy the items on a list or for a recipe, choose those things off the shelf and figure out how much money they need to make the purchase. You can easily differentiate this by having some students’ list have one item while others have multiple. Some students could have whole dollar amounts and others could have bill/change combinations and some students could have to make change. 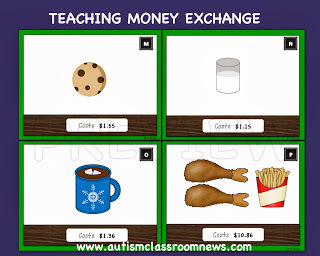 Students could even be the cashier and have to make change. 4. Set up a restaurant in your classroom. Turn your snack time into a restaurant. Make a menu with the available food items for snack and put prices on them. Then have students determine if they have enough money to buy what they want for snack (that they earned or you gave them to start with). Have a student serve as a waiter–this is a great way to have kids communicate with each other and figure out the check, write down the amount and give it to the customer. There are a ton of skills you can build into this. Program voice output devices for nonverbal students so they can choose what they want and ask for it. You can set it up as a fast food restaurant where they have to wait in line, or a sit-down restaurant where they wait for their food to be served, or any other type depending on your students. This gives money menacing and again links it to something reinforcing for the student. Never forget the step of community-based instruction. After students practice these skills in the classroom, take them to a restaurant or a grocery store and have them choose something to purchase and figure out if they have enough money. This is something that young children might do on a field trip occasionally but that middle and high schoolers might do weekly or more often as part of their regular curriculum to assure they can become fluent in navigating and using community services. With the holidays coming up, have students grocery shop to make a Thanksgiving feast or go to a store to buy presents for family members. Those are great opportunities to make sure that the money skills generalize beyond the classroom. 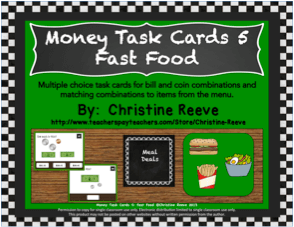 For the task cards, I talked about above, check out Money Task Cards 5: Fast Food. 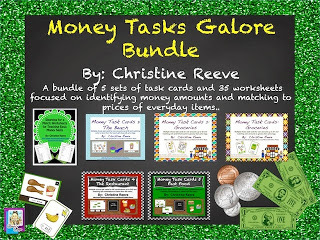 To check out all of my money task cards (not including next dollar skills) and worksheets, you can check out the Money Tasks Galore bundle for the links to the individual products and check out the previews. Clearly knowing how to count money but not knowing how to use it is not really useful. Yet many of our kids have difficulty making that leap. How do you help your students make the jump? My son is enrolled in a school supposedly for Autism called STEPS in Strongsville, Ohio. They have him integrated with a typical third grade class, he is 11, academically he is at a first grade level. The way the class is set up is he sits at the back of the classroom with his own teacher and one or two other students, while the regular teacher is teaching the typical third grade children in the front of the class. My son and the other two students and the special needs teacher have to be somewhat quiet because of the other class going on in the same classroom, their is no separation at all. Am I crazy or does this seem like a ridicules idea of so called integrating him with his peers. When I sat in on his class I was surprised to say the least of this set up and basically all he does are worksheets, nothing very spontaneous or fun, because they would be disturbing the other class. I found it very distracting and he seems to zone out a lot at school, but he says he likes his school, teachers and other students. He has been going to this school for about three years and this is the first year he has been totally integrated in the typical classroom, but I don't feel this environment is right for any student. 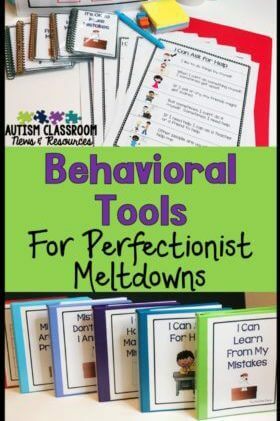 Previously he was in a special class, where the special needs children need more attention and were unable to be in a classroom, and my son is more high functioning and he would start to pick up many of their bad behaviors and digress in his work and behavior. I tried our public school originally and that was not a good experience they were more like baby sitters and not educators, but that was almost four years ago, I'm not sure if I should try with them again. He is on a autism scholarship and the school he is going to know is a catholic school that STEPS for autism has partnered up with, but I'm not really happy with either of my choices here and other special schools for autism like the Monarch School for autism and Cleveland Clinic are very expensive and out of my price range, which is very sad, that it's all about the money. I'm just wondering what's going to happen to all these kids who aren't getting the education and resources needed by their school districts, say in 10 to 20 years, when they can't hold a job and their life skills are limited because they didn't get the education they should have, it's going to be a huge problem and with the rate of children being diagnosed with autism climbing every year, I think it's time to start demanding better alternatives for our children. I am so disgusted with my limited choices for schooling for my son, it breaks my heart that it all comes down to money for him to be able to reach his potential and I can't give it to him. 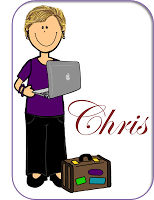 I would love to know if you have any suggestions for me or anyone in my area, that I can talk to or consult with that could make a difference in the life of my son, Chett.. I have talked to all the usual people recommended and resources and parent advocates, and blah, blah, blah. I have yet to find anyone who has been of any significant help, again please let me know if you have any information that could help me and I would like to know your opinion on the so called classroom integration they have my son in now. Thank You! Unfortunately without knowing your son or the situation I really can't comment on the appropriateness of the setting or the situation. I would encourage you to contact OCALI for possible resources as well as your local Autism Society that may have local resources to point you to. I understand your concerns and that is why this blog focuses specifically on assisting teachers in the appropriate education of children with autism (and other special needs). I'm sorry that I can't give you more specific information. I wish you luck and think that OCALI and the Autism Society may have resources that can help you.